Paige Mahoney is a clairvoyant and in this world her gift is seen as a threat which could have her arrested. The only place she can call home is within the depths of London's criminal underground, hiding from the city's security force - Scion - as part of the an illegal ring of clairvoyants called the Seven Seals. Her job, as a clairvoyant dreamwalker is to break into other people's minds. But Paige is soon captured by the Scion police after using her gift in public and is taken to Oxford, where she meets an even bigger foe…the Rephaim. This new species are an ancient race who have been collecting voyants for centuries to train them to become their own personal army. Paige is hellbent on getting her freedom back at any cost, even if it means learning something about her mysterious Rephaite keeper, Warden, and indoctrinate herself into this twisted new life. 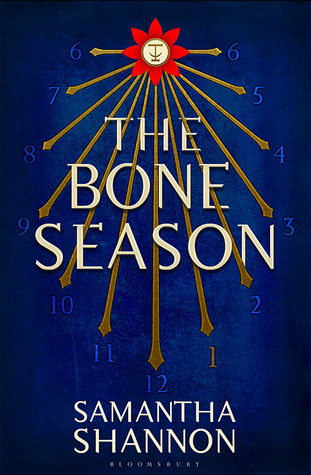 After the absolute onslaught of hype and promo for this book, I think it’s safe to say I had big expectations for The Bone Season, and it did start of well. Paige Mahoney is a tough, Irish born and bred female protagonist who’s not afraid to look you in the eye when she’s angry, I loved her resilience and slightly roguish quality in the way she acted during the book. The first few chapters were cinematic but once the story reached Oxford and the plot lines with the Rephaim, I felt the pace slow to a point where I wasn't quite sure what was going on. There’s no doubt Samantha Shannon has created a universe that is rich detail, but keeping up with the different traits of certain clairvoyants, the entire history of the Rephaim and Scion can feel a bit overwhelming and there were times where I wished information was actually held back a little to keep a little mystery about the world. Despite this, I can't fault intricate detail of Shannon’s universe, she’s really thought of everything in terms of history, current society (both the good and bad aspects) and even colloquial slang. I also found myself intrigued by the colourful host of diverse characters throughout the book, all of whom I'm hoping we'll get to see more of – especially Paige’s criminal cohort of the Seven Seals, all of whom seem like a pretty fascinating bunch. All in all, what really drew me into The Bone Season is the world and concept of the novel. Clairvoyancy is a facet of fantasy I haven't personally read, especially in this depth, so it was refreshing and original to me. I'll also give Shannon credit for the last few chapters of the book, I definitely felt the writing found its footing but it’s a shame it didn't happen sooner for me. Hopefully the second book in the serious, The Mime Order, will focus more on driving the plotline and characters forward, now the world of Scion and the Rephaim have been established, and I definitely see potential for the sequel to be greater. For lovers of…The Discworld series, Neil Gaiman, and JK Rowling.